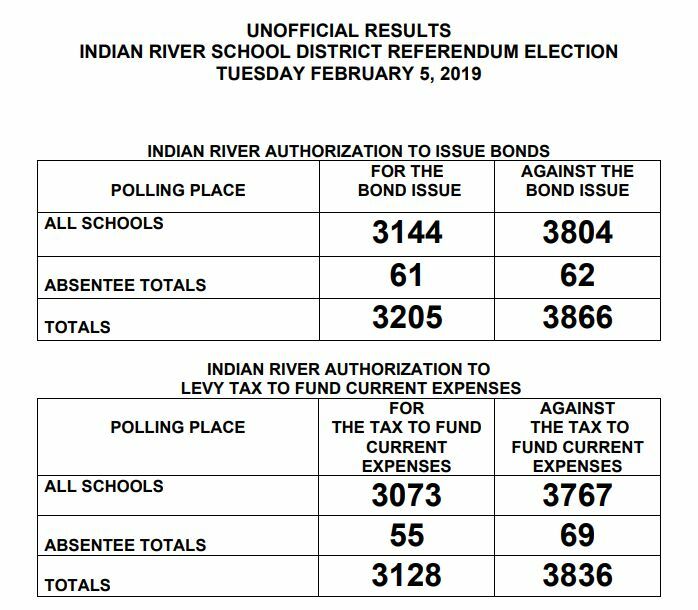 The Indian River School District’s referendum on capital improvement and current expenses was defeated on Tuesday. The referendum took place Tuesday, with district residents voting from 7am to 8pm. WGMD has learned on the question of Major Capital Improvements for the district, the vote were 3,202 for, and 3,866 against. On the question of Current Expense, the votes were 3,124 for and 3,838 against. The referendum would have provided funding for the construction of a new Sussex Central High School, as well as an eight-classroom addition at Indian River High School and a four classroom addition at Selbyville Middle School. The referendum also put forth additional funding for staff, curriculum, supplies, transportation and utility expenses.